RC Snowmobile just like the real thing - experience racing action in the snow with this radio controlled huge 24" Polaris snowmobile. 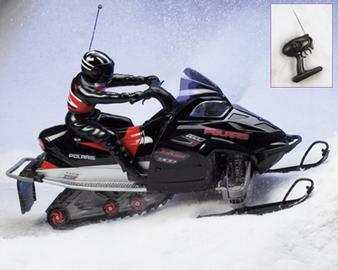 A 1:6 scale replica of the Fusion 900, this 24" long radio controlled snowmobile comes ready to run. It features powerful electric motors, working suspension and a full track design for punching through the snow and making smooth turns. The 2 channel controller provides long range fun never before available in the winter. Designed to be used outside but it can be used inside on carpet simply by changing the skis! Includes a removable action figure, controller (requires 1 9V battery, not included) and a rechargeable 7.2V NI-Cad battery pack. 15x26-3/4x15". Ages 8 and up. 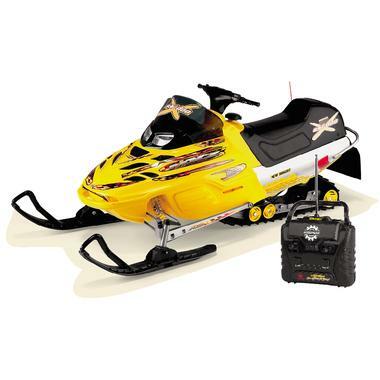 Another remote control Skidoo snowmobile model is available on some of the on line stores below.